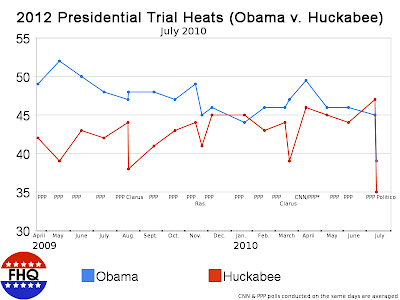 Here, though, is Huckabee very closely matched against Obama in polls in 2009 and 2010. If you scroll below to the time series regression, it is evidence of a trend toward parity among the two men in a future race. Still, very much like Obama in 2006-2007, Huckabee is in the position of needing early primary/caucus wins in 2012 to legitimately enter the discussion. The establishment is not behind him like Romney, nor is there as much grassroots passion behind him as Palin commands. That is not a good combination despite good numbers. 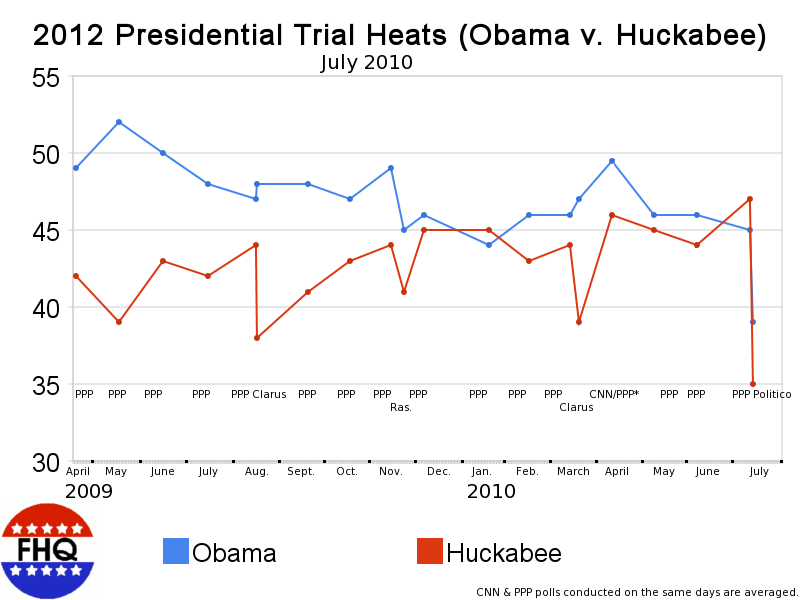 Unlike Romney, Huckabee cannot lean on the "I'm the better general election candidate" if it is a Palin-Huckabee argument. He doesn't have either of the establishment or grassroots pieces of the nomination puzzle. The former governor has to hope to catch lightning in a bottle again and win Iowa to force the issue. 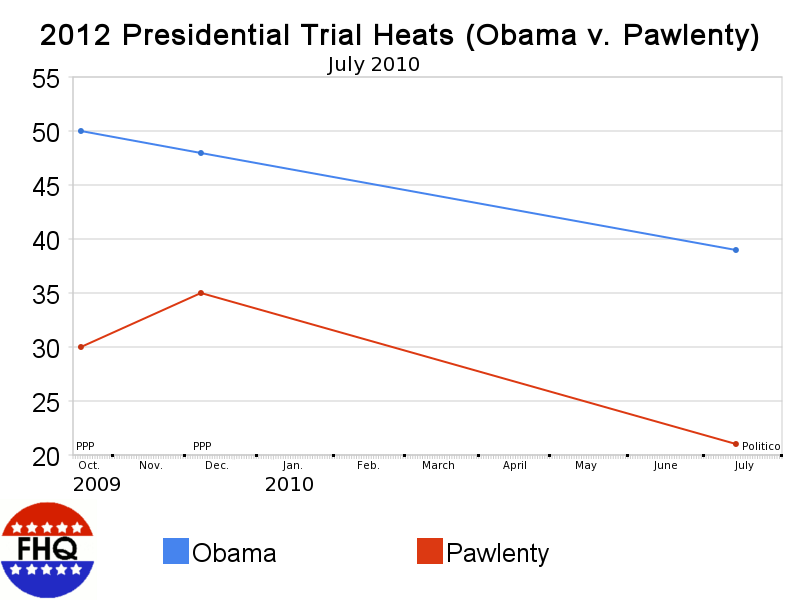 As FHQ has not updated its 2012 presidential trial heat poll graphics since December, there is a lot of catching up to do. And what better place to start than with the most talked about candidate, former Alaska governor Sarah Palin. Let me make a few notes before diving in to all of this. First of all, I will spare you the mess of all the candidate data being dumped into one post by splitting this up into one post per candidate. We'll start with Palin and move on to the other candidates who have been surveyed multiple times in a hypothetical match ups against the president. I don't know whether I'll continue this practice in the future, but it makes sense in trying to synthesize all of the data from the first half of 2010. One addition I have made here is to add a table with all the past numbers included (dates, sample sizes, margin of error, etc.). [You'll find that at the conclusion of the post.] Such an inclusion likely works against the traditional -- all candidates in one -- presentation of the data if kept permanently (and I think it should be. There is too much data now not to.). The best course of action in future is likely to have timely breaking news-type updates when new polls are released followed by updated graphics for each candidate and finally a post discussing the trends across all candidates. That is how we will procede in the short term anyway. There are a few other things to mention as well. Obviously, things are getting bunched up with so many polls having been conducted in the cases of some candidates. This is most problematic in terms of reporting the polling firms on the figure itself. It is really pronounced in the case of Obama v. Palin. I doubt this practice will be able to survive for much longer. FHQ is currently looking into some Flash- and Java-based alternatives that will allow users to simply hover over a data point on the graph and receive the attendant information. I'll keep you posted on that progress and in the meantime, if anyone has suggestions on how to do that relatively quickly and easily, please just drop a note in the comments section or shoot me an email. And what of Obama and Palin? For the sake of brevity, FHQ will confine this catch-up analysis to the overall trend throughout 2010. A poll-by-poll analysis eight months into the year seems like overkill. 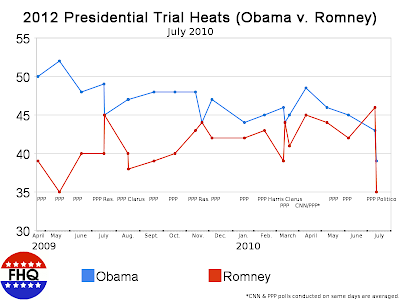 Public Policy Polling has surveyed this match up every month since March 2009 and as such is by far the most consistent player on the 2012 polling front. 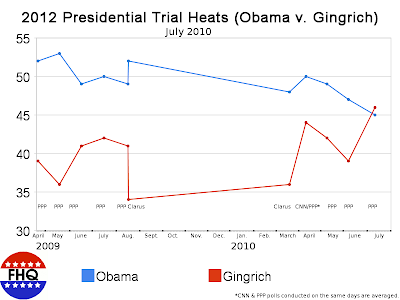 Palin has fairly regularly brought up the rear compared to the other three regulars (Gingrich, Huckabee and Romney) against Obama and yet, she, like the others has seen her share of respondents increase in 2010 as Obama's approval has declined. The one noticeable trend is that Palin does better in the PPP (and Rasmussen) surveys than she does in polls conducted by other firms. That is likely to elicit the classic robo-call versus live (phone) interview debate among some, but with so few polls from other outlets, FHQ will simply rate it as something to keep tabs on in the future. Palin's PPP presence has shifted from consistently in the 30s in 2009 to consistently in the 40s in 2010. Other firms are more likely to find her in the 30s in 2010. The bottom line in this hypothetical match up is that Obama stays closer to 50% against Palin than he does against any of the other regular GOP names in the presidential race. I'll dispense with the straight averages comparison -- it is included in the table below -- but will mention the regression time series. Taking that trend into consideration, Obama leads Palin 49-41. That is all well and good, but none of this particularly matters until and unless the Republican nomination race in 2012 boils down to a two person race where general election electability becomes the argument a la Obama v. Clinton in 2008. CBSNews picks up where FHQ left off late last year: with a look at the Twitter followings of the potential 2012 Republican presidential candidates. The talk of the evening and this morning -- at least on the 2012 presidential front -- is the discrepancy between the Public Policy Polling survey on 2012 general election scenarios (FHQ mentioned the numbers from it yesterday.) and a new national poll from Time Magazine. The point of overlap -- again with 2012 in mind -- is the Barack Obama versus Sarah Palin question. 21-0. That's a large gap. FHQ natural inclination in a situation like this is to split the difference and move on. None of this is without caveat. 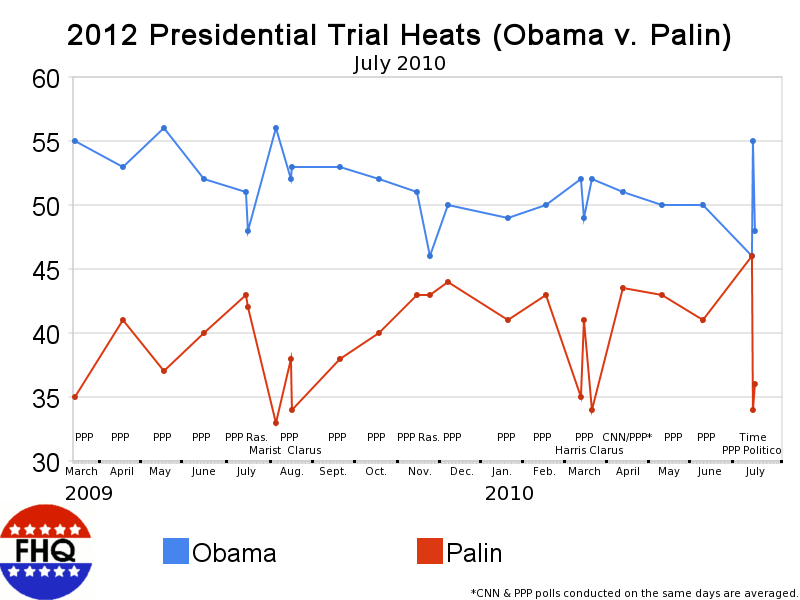 PPP has conducted a national 2012 trial heat poll between Obama and Palin every month since March 2009. The Raleigh-based polling outfit, then, has established something of a baseline in this hypothetical race. 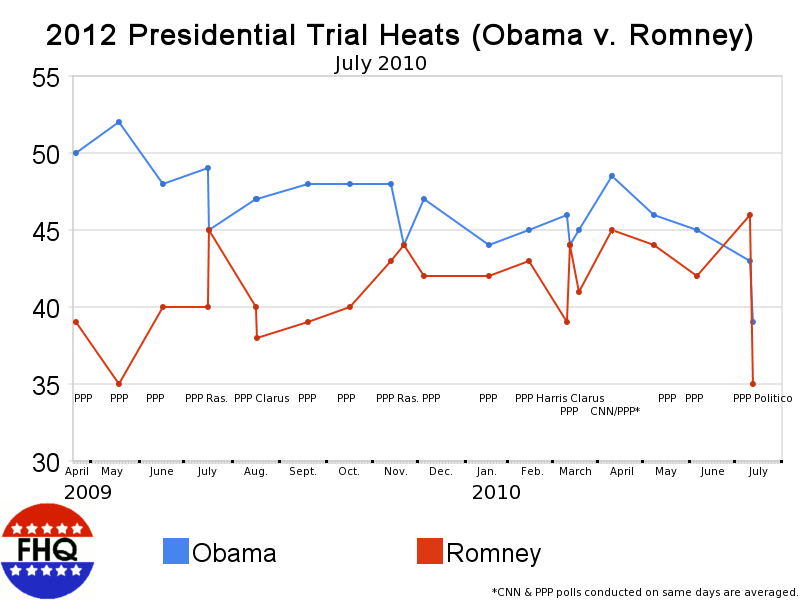 But there has been some variability in those polls as well. Things were similarly tight between the two candidates back in April before jumping back into the high single digits in May and to ten points a month ago. So, before saying the true, yes hypothetical, lead is 10 points and moving on, allow FHQ one last comment. Tom Jensen said it best in the wrap up to his post on the poll's highlights a day ago. I'm paraphrasing here: Perhaps we'll look back on this time and see this as an aberration for Obama or the point at which the wheels really began falling off. That's true. One thing is for certain though and this hasn't really been talked about enough. No other Republican candidate can solidify the Democratic base better than Palin. To be sure, she can perhaps do a good job of unifying the Republican Party as well. Her presence on the ballot would do wonders for the oft-cited enthusiasm gap that the GOP holds in terms of voter turnout during 2010 (and maybe 2012 as well). It would neutralize it. What Palin has to do if she is serious about a run at the White House is figure out the formula for adding independents. Until the former Alaska governor can do that consistently, the true gap between her and Obama will likely stay in that high single digit to 10 point range. If Obama keeps trending downward, that won't hurt Palin's cause. 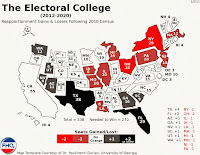 Public Policy Polling [pdf] today released the numbers on their monthly national survey on the 2012 presidential election. From all indications, President Obama is losing independents; something that has been seen in recent approval numbers as well. 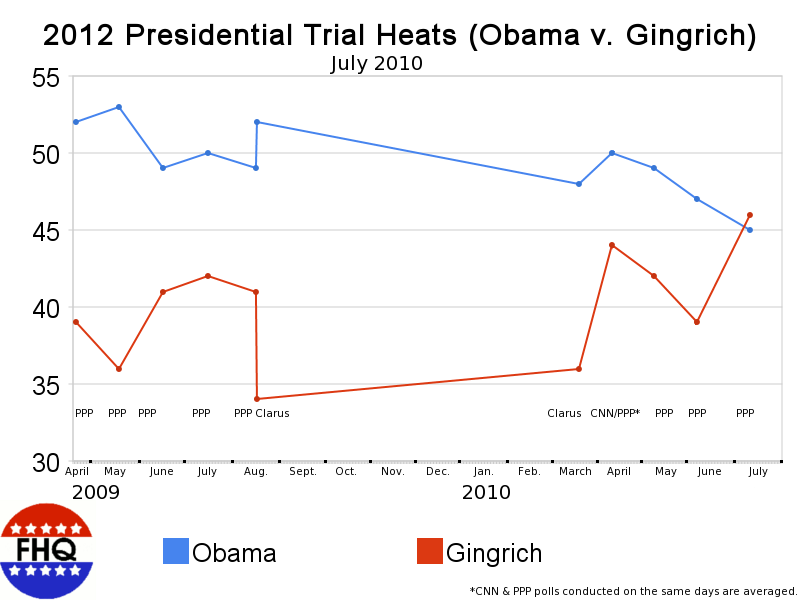 Obama trails (Gingrich, Huckabee, Romney) or ties (Palin) all four of the major Republican candidates. Obviously 2012 is a long ways off and the immediate relevance of these numbers is limited. It's possible we'll look back on polls like this 28 months from now after Obama's been reelected and laugh. But it's also possible that we'll look back on the summer of 2010 after he's been defeated and see it as the time when his prospects for reelection really took a turn for the worse. For now there's really no way to tell. No way to tell indeed, but those traditional indicators of presidential electoral success -- presidential approval and the economy -- certainly aren't hurting the GOP's prospects at the moment. If you have continued stopping by you have noticed several changes. First of all, when Blogger rolled out its custom design feature in June, I jumped at the chance to update the simple and, I think stagnant, FHQ look. That was the biggest visual change since we added the left-hand sidebar during 2008. The new look is obviously still simple, but it is a little sleeker and adds the background image behind the large white slate that dominates the page. In the last month, FHQ has also become a presence on Facebook. Personally, I don't have that large a presence on the social networking site, but far be it from me to deprive FHQ readers who do use Facebook frequently from using that tool as a means of getting their FHQ fix. There is a button (see above) underneath the Twitter section on the right side that you can click on to access the FHQ Facebook page. Once there, click "Like" next to Frontloading HQ at the top to add the page to your News Feed. All blog posts are automatically added to the site and most tweets -- those not retweeted from my phone -- appear there as well. It ends up being a nice storehouse of FHQ material and is quiet handy if you are already on Facebook (and a lot of people are...a lot). Finally, I've also made it easier to share FHQ content on other sites. At the conclusion of every post you will see a host of tiny buttons you can click on to share content at other sites (Facebook, Twitter, Reddit, Digg, Google Buzz, etc.). All you have to do is click on one of those to do so. And hey, there's even a Facebook Like button down there as well. I'll probably bug people about Facebook (and Twitter for that matter) by reminding you of the addition at the conclusion of each post for the next couple of weeks. You've been warned. [Oh, it will stop soon enough.] Yeah, I think I've sold out a bit to be quite honest with you. Last Friday FHQ openly doubted that the Democratic Rules and Bylaws Committee would set dates for the four exempt states in the presidential primary process. As I said then, I thought it would be more likely that the committee would set the parameters around which those states could place themselves. Alas, the committee chose specific dates. In my haste to get the notice of the impending meeting out to FHQ readers, I failed to adequately consider even recent historical precedent. Iowa holds the first-in-the-nation caucus on January 14. New Hampshire holds the first-in-the-nation primary on January 22. 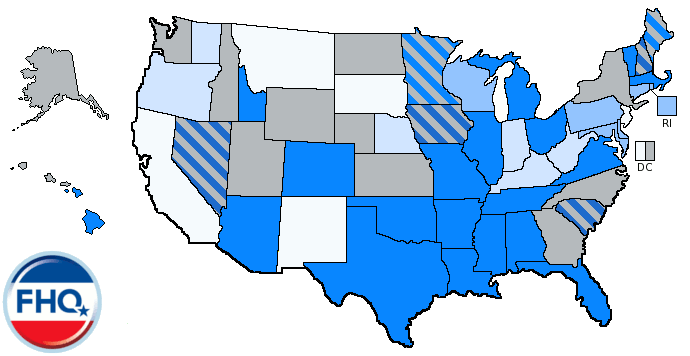 Nevada conducts a caucus between Iowa and New Hampshire on Saturday, January 19. The regular window will open for all other states on the first Tuesday in February -- February 5, 2008. Now, of course, Florida and Michigan came along and threw a monkeywrench into even the best laid plans. 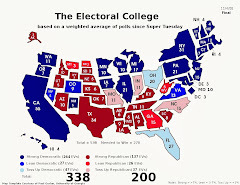 Obviously, New Hampshire balked at Nevada's caucuses being ahead of the primary in the Granite state, but it wasn't until after Florida's move -- or the early progress of the bill to move the Sunshine state's primary in the legislature -- that that January 22 date was truly threatened. [Granted New Hampshire Secretary of State, Bill Gardner, did issue an early 2007 statement that New Hampshire would stick with its date if Iowa stuck with theirs.] What kept the ball rolling on the pre-window movement was the South Carolina Republican Party's response to Florida's potential move. To be sure, SCGOP chair Katon Dawson's threat of an October 2007 GOP primary in the Palmetto state was pure bombast, but it was enough to stir an already unsettled primary calendar hornets nest. Florida solidified its position on January 29 in late May and South Carolina Republicans jumped the Palmetto state's Democrats (and Florida) to share the January 19 date with both parties' Nevada caucuses in August. And August was busy because that was when the Rules and Bylaws Committee decided to penalize Florida all of its delegates if it followed through with plans to hold the contest outside of the window period. It was also the month in which Michigan began to seriously push its own move into January 2008. That Wolverine state shift became official in September before South Carolina Democrats requested a waiver from the DNC to move from January 29 to January 26 in October. And that was on the cusp on the Iowa Republican Party's decision to settle on January 3 for the caucuses there. [Iowa Democrats followed suit nearly two weeks later.] All that was left then was for New Hampshire to choose a date. After toying with a December 2007 primary, the Granite state selected January 8 as the date on which its primary would be held just prior to Thanksgiving. It isn't any earth-shattering news that there was movement -- a lot of movement -- on the 2008 calendar, but some of this pre-window jockeying often gets lost in the shuffle. It all becomes very SamandEric (the twins) from Lord of the Flies. In this case, though, it's FloridandMichigan. The bottom line is that the parties can make all the rules they want, but the states will decide whether they want to go along with them or not. FHQ was 50/50 in guessing the possible dates. In an earlier post, I guessed Iowa and New Hampshire correctly, but missed on Nevada and South Carolina. Of course, it doesn't take a rocket scientist to guess that Iowa and New Hampshire would be placed on the earliest allowed dates that keep both in February and with an eight day cushion between them. ...and the states' reactions throughout next year. Now, some have called the rules recommendations that came out of the this meeting and the earlier Republican meeting, the "most significant alteration to the primary calendars since '68..." The McGovern-Fraser reforms fundamentally reshaped the way in which presidential nominees were chosen from that point forward. They turned presidential primaries and caucuses from non-binding contests meant to influence party leaders at the national convention into binding contests that determined to some degree the level of support candidates would receive at the convention. The primary calendars after that point evolved, and though the negative effects of frontloading were being discussed as early as the Hunt Commission (the pre-1984 cycle's equivalent of the Democratic Change Commission), it took until 1988 and into the '90s for the full effects of McGovern-Fraser to be felt in terms of the calendar. And, of course, these were unintended consequences of those reforms. Perhaps you can tell, I don't particularly like the comparison to the 1968 Chicago convention's reform measures. FHQ also has another problem with this comparison. * As I alluded to above, it overstates matters. Both parties have recognized frontloading as a "problem" for several cycles now. And it is no small feat that both the DNC and RNC determined that the best way to combat the problem was to work together, representing a unified front against would-be rule breakers (Florida and Michigan, I'm looking in your direction.). That fact alone is significant in and of itself, but this process is only in its first phase: rules formation. The national parties will have to ratify those changes in order to end this part of the cycle. The next phase will play out through much of next year. It is one thing to institute new rules, but it is another to have the states go along with those changes. A good first step is to have both parties on the same page, but Florida and Michigan (and all the pre-February 5, 2008 states but Nevada and Iowa on the Republican side) may have set a precedent in 2008. And with so many states having to move the dates on which their primaries are held to comply with the new rules, there is more incentive than ever to shirk. That was the real message that came out of all of these meetings on both sides. Both parties are together in terms of their calendar set ups, but the sanctions did not change in the least from 2008. Yes, the Democrats bumped up their incentives for states electing to hold later contests, but that has proven ineffective in the past. The true effect of one of those 2008 sanctions likely won't be felt until 2012 anyway. That the Democrats stripped candidates of half their delegates if they campaigned in a state in violation of the timing rules was very crafty. 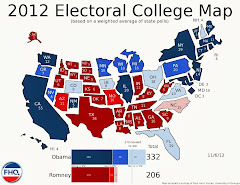 It kept Obama and Edwards among others out of Florida and (they took themselves off the ballot in) Michigan. That has the effect of making a state meaningless or at least far less influential than otherwise. And that penalty is back for the 2012 cycle. States might have thought twice about flaunting the rules if that sanction was in place on the Republican side. Of course, it is a Democratic sanction and I doubt it will matter much if the Democratic Party strips Obama of half his delegates in a state in violation (they won't). With all the action on the Republican side, a promising sanction won't mean a whole lot. As I said over the weekend on Twitter, it only takes one state to unravel the best of intentions and trigger a calendar somewhere between what the parties want and where things were in 2008. So, while tweaking the timing of contests is unique in the post-reform era, it isn't that fundamental a change in the grand scheme of things and certainly won't be if states don't comply. *Another issue is that the parties did voluntarily change their rules to allow January and February contests over the last decade and a half. That was at least an equivalent change to what has been proposed for 2012 (proportionality rules excluded). Setting the 2012 calendar: There’s another meeting to watch today -- this one in D.C. At 1:00 pm ET, DNC’s Rules and Bylaws Committee meets, and it’s expected that they’ll vote on dates for the pre-window states (IA, NH, SC, NV) and reducing the influence of superdelegates. FHQ doubts very seriously that the R&B selects the dates for the four exempt states. They might set the parameters from which those states will make their choices, but they won't set the dates. Each will wait as late as possible in the process (next year) to finalize those dates -- to ensure that they are as safe as possible at the beginning of the process. We haven't touched base with Frank Leone at DemRulz, but he is expected to be on-site today and tomorrow. Check in there for updates and here for some ex post facto thoughts on the full meeting on Monday.